Don on your Sumo foam packed Wrestling Suits (we can’t promise they are flattering) and head protector. The object of the activity is to either push, pull, trip, or throw your opponent out of the circle on the mat. 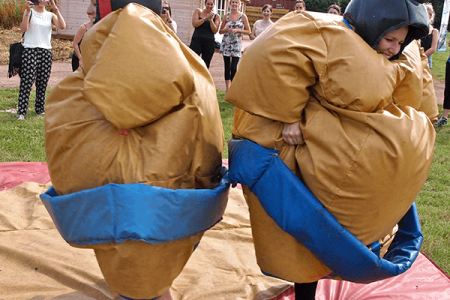 “We had a lot of fun sumo wrestling, gladiator duelling and getting involved in highland games for my cousins hen do. The staff were a great bunch, super friendly and kept us all laughing. Highly recommend booking this if you want fun filled activities!" 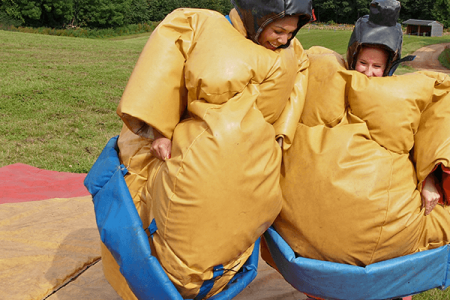 “We had a great day Quad Biking and Sumo Wrestling for my sister's hen party in Edinburgh. The guys were great and the activities were amazing! Recommend using Great Away Days for similair activities!" What's included: Super sumo suits with head protectors, Instructor, £10 Million Public Liability.